Podemos, a new Spanish political party that includes unconditional basic income (UBI) as won of its main economic policy objectives, has one five seats in the European Parliament. Organized barely three months before elections for the European, the party seemed to come out of nowhere to a win nearly 8% of the vote (1.2 million votes) and finish in fourth place in the elections held on May 25, 2014. 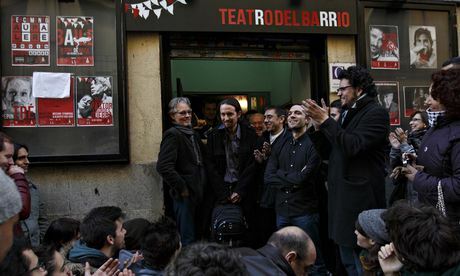 Podemos (which means “we can”) grew out of the anti-austerity protest movement known as Indignados. It claims to be a party of ordinary citizens who desire a fundamental change in the political process toward greater democracy, freedom, and social protection. The Guardian quoted the Party’s leader, Pablo Iglesias, “It’s citizens doing politics. If the citizens don’t get involved in politics, others will. And that opens the door to them robbing you of democracy, your rights and your wallet.” Party leaders promise to accept a salary of no more than three times the Spanish minimum wage. It’s great to see people willing to help the needy but it’d be even better if people could see that society has a surplus that belongs to everyone and if we shared it fairly, there’d be no need to create a basic or minimum extra income. It’s ironic that supporters propose paying this extra income but do not explore how to fund it. If they did, then they’d have to see the surplus, our common wealth, now merely funding a few private fortunes, and of course they’d call for sharing it. More at Progress.org.